This was a very interesting book for me as I have to admit to not knowing how I felt about it for the first half of the story. The story tell the journey of four young teens, mostly from Natasha's POV, as they meet up with their perspective family member in the deserts of Iraq. A vacation to visit their parents who are working an archeological dig turns into more than they ever bargained for when they are thrust into difficult situations and possibly even more difficult feelings. This is not only a suspense novel that YA readers will enjoy but also a story about four teenagers discovering who they are and who they want to be. 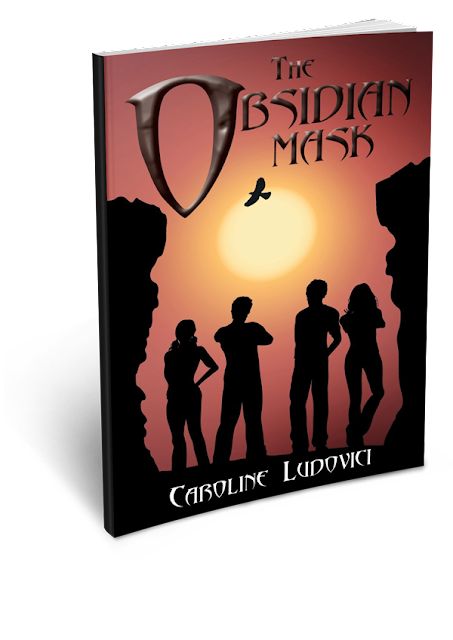 I was enamored with the prologue of The Obsidian Mask, coming from a historian side I loved the idea of this Warrior-Queen and her determination to save her people. I have to admit that I would have loved to have more of her story and would have liked to have known what ended up happening to her people, although we get a pretty good idea of how things will play out. It leaves you feeling much like I imagine one would on an actual Archeology dig, where you are piecing together the past, present, and the 'future' of a people from small pieces of information. Just makes me all that more curious to know more about them. I also appreciate this story for the light it shines on desert nations such as Iraq. The history of the world lies in the sands of these deserts and it is painful to know that much of it will never be known due to political machinations, corruption, greed, and conflict. If people read this book for nothing else but to take a small glimpse at what these countries hold in the depths of their sands I think this book will have been successful and left a lasting impact, particularly on younger readers who may find an interest in history and archeology. The middle of the book slows down a bit, it is a lot of Natasha learning to cope with her feelings about the people around her, her relationships with them, and their relationships with each other. I have to constantly remind myself that these are young teens who are just coming to terms with these types of feelings and learning how to deal with them. I found myself struggling a time or two to not get frustrated with Natasha's own brattiness when she is mentally calling out people for their own. I will say that while you may find yourself wanting to just skip pages don't, the book is slower at this point but I think understanding who each of these children are is a major point of this story. Things definitely pick up in the second half of the book. This is where all the action truly begins to happen and the hero's in these children are made. Where they learn that they are Brave, Reliable, Trustworthy, Strong, Caring, Able, Intelligent, Worthy... It is where we see who they truly are. In fact I enjoyed the second half of this book so much I would love to see more of these four teens. I would love to see them visiting more of their parents worksites and finding their way into more adventures. I would love to see Yanni again, he was probably my favorite of all the characters in the book, wise beyond his years, calm, patient, caring....and possibly much more. It would be amazing I think to continue to watch these children grow into 'adults' and follow them as they go off to (as the British would say) University. I loved how detailed Caroline gets in her description of the dig site, it was so easy to see it in my minds eye, although a drawing (such as Natasha's mom, Julia, might do would be an amazing 'gift' to go along with the book. I enjoyed the thought she put into how a dig site would work and wonder if she has first hand experience in this field. Having younger teens read the story especially if they have an interest in this type of work could go a long way to encouraging that excitement for adventure (and also a patience they may not realize they will need) for this type of work. I think this is a great read for younger YA readers and up. There are some emotional aspects (possible first love, divorce, remarriage, death, jealousy...) that keep me from saying it would be a good solo MG read, but if read with a parent even young MG readers would enjoy this story. Anyone looking for a bit of an adventure, suspense, and history would find this story enjoyable! Caroline was born and raised in central London, and from a very early age, she developed a hunger for adventure and hot, desolate places. She loves to learn about different customs, peoples, and to go off the beaten track wherever she can. She has been lucky enough to have traveled extensively throughout the world, spending considerable time in many countries of diverse and interesting cultures, soaking in the history. Caroline has also lived in Sweden and spent a year in New Zealand and Australia, taking six months to get there and back. However, her dream is to spend a few months following the ancient trade routes, from China across to the Mediterranean Sea. 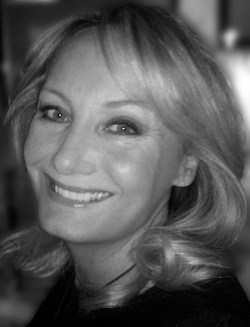 Caroline especially loves the Middle East, and as well as exploring Tunisia, Egypt, and Iran, where her parents lived for a couple of years when she was in her late teens and early twenties, she spent ten days in the Jordanian desert, following the footsteps of T.E. Lawrence. Her passion is archaeology, and wherever she goes in the world, as well as visiting ancient sites, Caroline absorbs herself in the local customs and history, avoiding the hordes of tourists where ever she can. 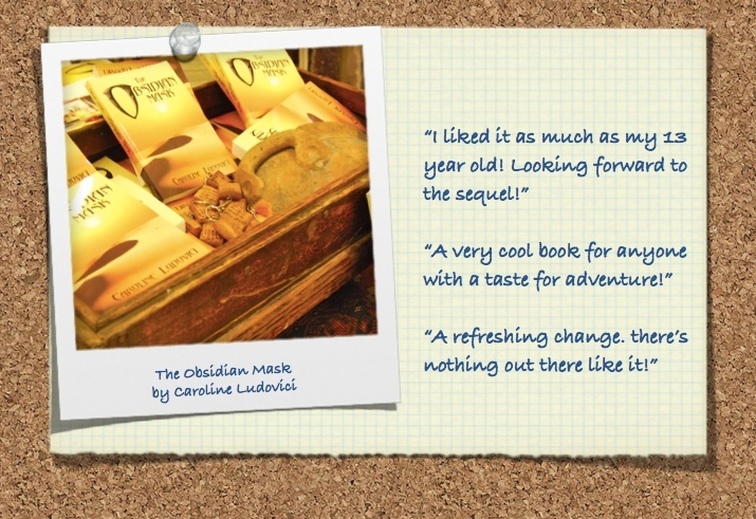 The Obsidian Mask is Caroline's first book. The sequels, Secrets of The River, and The Irish Queen of Algiers, also reflect her love for travel and history, as well as giving her readers a fun and exciting adventure to enjoy. It has given her much pleasure writing these books, and she hopes you enjoy reading them as much as she has enjoyed writing them! Caroline has also written some short stories for pre-teen readers, and a collection of short stories for women in a series called, Coming of Age. When she is not writing she is either playing tennis or volunteering her time running a store/art gallery that dedicates itself to local artists? She is married and has two children, and she spends a lot of time on airplanes hopping back and forth from England to America, which is where she currently calls home. Such a wonderful story...I am looking forward to the next book! Thank you for having me along!